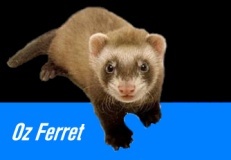 NOTICE: Due to the ever rising costs of running this site, Oz Ferret is currently operating week to week. If you'd like to make a donation to assist in the running of this website please click here. It should also be noted that most of the content here is quite old and outdated and is still online for "entertainment" purposes only. Oz Ferret was started to bring together ferret enthusiasts from all over Australia. Just about all the states in Australia have their own ferret clubs and societies, however these are often limited by state boundries as far as communication between members goes. For this reason we hope to build up an Australia wide ferret community so people can share their fuzzy love and have a central source of information. Oz Ferret has its very own free ferret club which anyone can join. Members can add photos to their profiles, keep ferret records and view other members' profiles and photos. If you're not a member yet and would like to join, click here to complete an online membership form. Please join our Ferret Forum and post a little about yourself and your ferrets. The forum covers all types of pets including ferrets and we may eventually steer it away to its own if the demand is great enough. Working with Ferret groups Australia wide we are aiming to achieve a national support network for ferrets. Clicking your state on the map above which show each states ferret groups and other useful local information. Want to adopt a ferret? Click here! You are not logged in, login. The Oz Ferret site is dedicated to Rusty, Demi, Slinky, Demi Monster and Lucky. Our boy Rusty crossed to the bridge on the 7th of November 2006 and is sadly missed. Click here to read his tribute. Our girl Demi crossed to the bridge on the 16th of January 2008 and will forever remain in our hearts. Click here to read her tribute. Our boy Slinky crossed to the bridge on the 6th of July 2008 and will be missed dearly. Click here to read his tribute. My girl Demi Monster crossed to the bridge on the 29th of January 2009. She was only 14 months old when she passed over and will be greatly missed. I love you little Demi Monster. My boy Lucky crossed to the bridge on the 3rd of July 2010 and will be missed dearly. Click here to read his tribute.